The Libra coverlet adds a dramatic pop to your bedroom with a bold chevron print that creates a fun vibrant look to any bedroom. A smaller scale gray and white chevron print covers the reverse. Made from polyester microfiber and cotton fill for easy care. 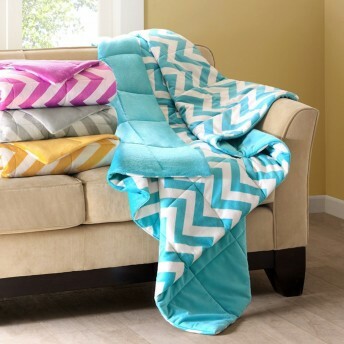 Comes with adecorative pillow and standard sham with a corresponding chevron print. Twin/Twin XL Coverlet: 68" x 90"
Full/Queen Coverlet: 86" x 90"
King Coverlet: 104" x 90"